Dr. Dash is a Development Sociologist. 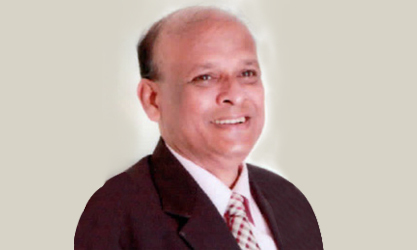 He has served as Professor of Sociology at Utkal University in Bhubaneswar (Odisha.) Dr. Dash has also been a visiting fellow at the Universities of Bremen (Germany), Osnabrueck (Germany), and Arbetslivscentrum, Stockholm (on a Swedish Institute Fellowship), and a Ford Foundation fellow at the Management Development Institute (Microfinance) at the University of New Hampshire (USA). His interests also include Social Finance and Social Banking; Socially responsible and impact investment; Corporate Social Responsibility; Community Financing; Local Institution Building and Community Empowerment; and Development beyond GDP. Dr. Dash is a widely-published author on these themes and has also lectured intensively on these subjects through his research-practice engagements. At the CIVICUS World assemblies in Glasgow, Dr. Dash coordinated and led a series of three workshops on Results-Based Governance and Impact Accountability for development organizations, in collaboration with the Scottish Council of Voluntary Organisations. He co-chaired a session on Social innovation and Development and spoke on “Social innovations and Institutional Challenges for Microfinance” at the FP7 (Socioeconomic sciences and Humanities) research conference, European Union on “Challenge Social Innovation” in Vienna. Dr. Dash was invited by the International Cooperative Alliance to contribute to its think-piece on Cooperative Growth for the 21st Century (ICA/Cicopa, Brussels 2013). His work through the Global Research on Improving Impact of Microfinance on Poverty, coordinated by three British universities (IDS at the University of Sussex, University of Bath, and University of Sheffield, and supported by the Ford Foundation, USA) and involving nearly thirty partners all across the globe, has been highly influential in shaping the Social Rating and Social Performance standards among Development Finance Institutions at a global level. More recently, Dr. Dash was invited as a South-South and Triangular Cooperation (SSTC) Fellow of the International Labour Organization (ILO) at the Social and Solidarity Economy (SSE) Academy in Johannesburg (South Africa, 2015), and to the UN Research Institute for Social Development (UNRISD)/ ILO forum on Social and Solidarity Economy (2014) and Social and Solidarity Finance (2015) in Geneva.